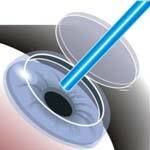 Photorefractive keratectomy or PRK laser eye surgery is another all-laser LASIK procedure. PRK LASIK does not require a corneal flap to be cut. Instead, some of the epithelial or covering cells of the cornea are removed. These cells grow back rapidly. Then the surgeon uses a laser. The laser reshapes the cornea. This type of all-laser LASIK has fewer complications than the surgery that uses a flap. There is a lower risk of infection. Many patients choose PRK LASIK for this reason. After the surgery, the doctor will place a contact lens over the place where the epithelial cells were removed. You will keep this contact lens in place for a few days while your own epithelial cells grow back. Whether you are having astigmatism laser eye surgery or correcting other vision problems, you need to be aware that sometimes the surgery has to be repeated. PRK surgery has a longer recovery period than regular LASIK. You may not be able to drive for a couple of weeks. Some people experience new problems after the surgery. There is a small chance of getting a corneal infection. Some people have problems seeing at night. They might see halos or glare when they look at lights at night. Dry eyes are another risk. It is also possible for the surgeon to over correct or under correct your vision. If tissue is removed unevenly, you could actually develop an astigmatism as a result of the surgery. The best outcomes for PRK and LASIK are in people over 20 whose have gone for two years without having to change prescriptions, people who are in general good health, and those who suffer from mild to moderate nearsightedness, astigmatism, or farsightedness.